Good morning my lovelies! I’m up and awake, already productive at work, how about you? I feel so refreshed these days, thanks to my miracle in a jar, a sleeping pack that replenishes my skin with ample moisture! 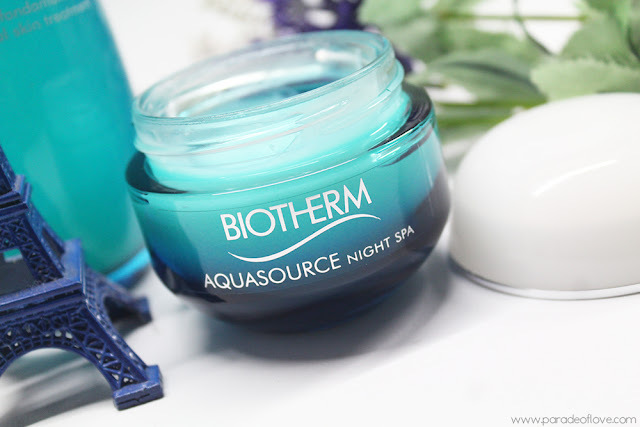 I’ve been a diligent user of the Biotherm Aquasource Night Spa for more than a month now and I am ready to report back on how it performs! Truth be told, I was sceptical at first because I thought the Koreans will do it better in terms of a sleeping pack. 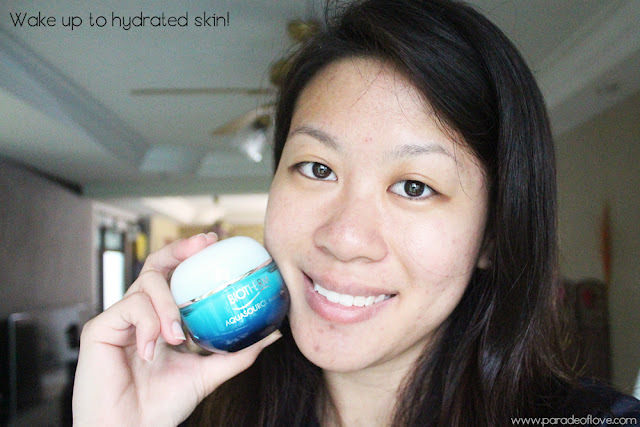 Surprise surprise, I am in love with Biotherm’s now! 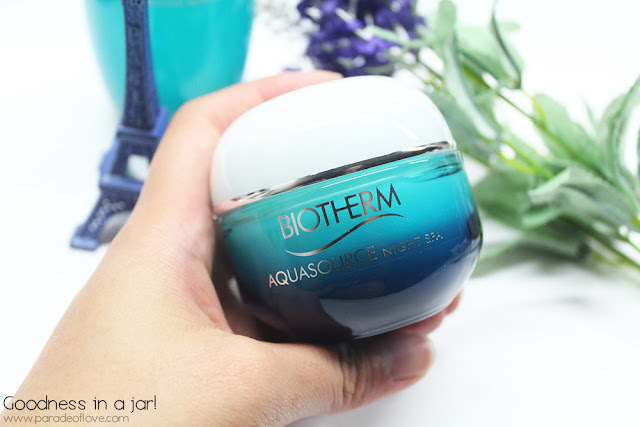 No fancy packaging, just a dark blue to light turquoise gradient jar with silver lettering on this sleeping mask, reflective of the product it contains – hydrating, ocean-fresh, refreshing yet plush. 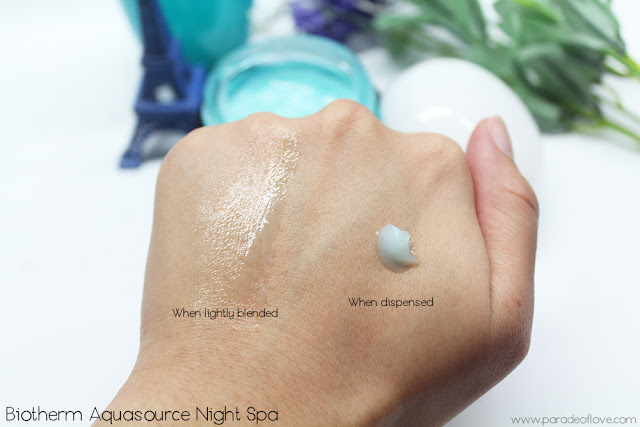 I’m all about hydration products because of my history of acne scars and I must say that the Night Spa is a gift for my skin. 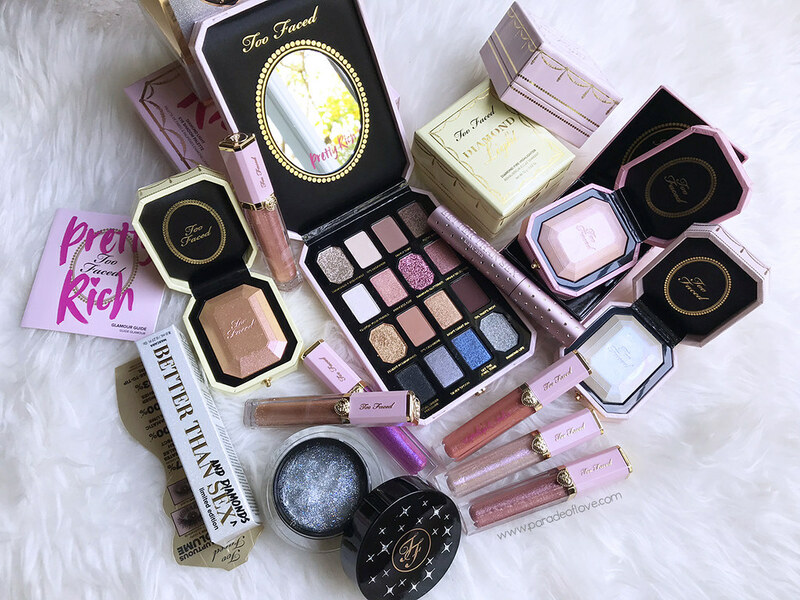 Hydrating skincare helps in healing my old scars and preventing my skin from breaking out as well, hence I’m always on the lookout for such products. With Aquasource’s iconic moisture formula, the product comes in a rich, dense and gel-balm-like texture. Despite being rich, it feels light, watery and non-greasy on your fingers as you apply it onto your skin. 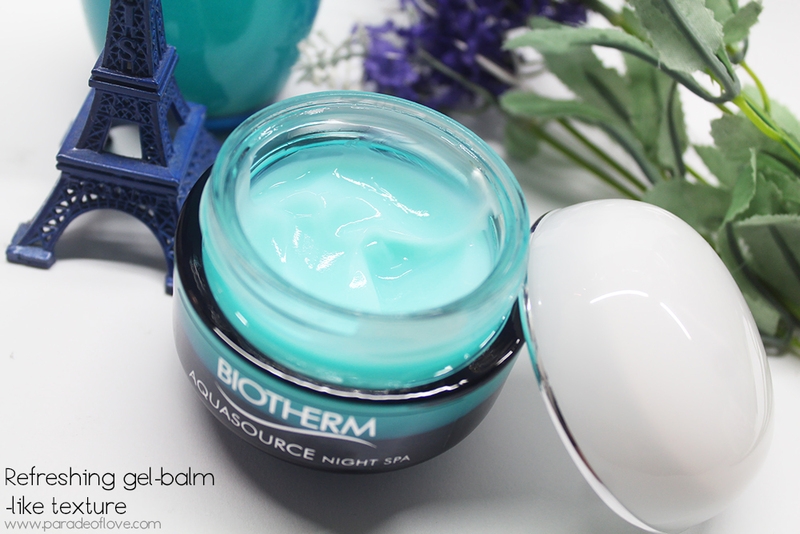 It feels rather velvety minutes after application, which is a rather comfortable feeling on the skin before bed. I was told that it gives you a slight tingling sensation when you first apply because it’s meant to recreate that spa-like effect, but I didn’t experience any of those sensations. Just bear that in mind though in case it stings for you. It works differently for different skin types I guess. I love how the texture is watery-light yet richly dense and not sticky. Upon application, the skin feels refreshed and moisturised. You can visibly see that your skin is plumped up and revitalised the next morning. I kid you not, you can get a sample at the store to try it out for yourself and you’ll understand. However, I am not so in favour of the scent. I would imagine this smelling like the ocean but it kind of smells like an air freshener, the one in the ocean scent. Feels a little too overwhelming for me though but I still use this anyway because it keeps my skin adequately hydrated. The scent annoys me a little but goes away minutes after you apply, so it’s not much of an issue for me. I’m not afraid to bare my skin in front of the camera just to show you how my skin looks like without any forms of makeup or colour-correction because this is the real @paradeoflove, the real me behind the makeup mess and skincare stash. 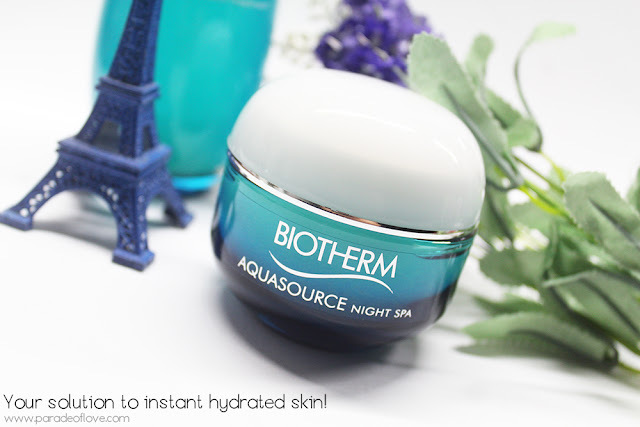 This complexion on camera (I use a DSLR, so you can see every single scar/imperfection), is one of the best I ever had in a few years and I am proud to say that the Biotherm Aquasource Night Spa contributed so much in helping me achieve another milestone to radiant and hydrated skin! No words can express how this product worked in deeply hydrating my skin. I can only say this much and you have to really try to see it work its magic on your skin! All in all, despite its scent, I must that this is my instant fix to dull and dehydrated skin! Really witnessed the results in one night. Amazing! Disclaimer: The product is sent by Biotherm Singapore for my consideration. The above review is based on my true and honest opinion without influence from others. I am not affiliated nor compensated by the company.